Dr. M. Mahtab Alam Rizvi is Associate Fellow at Institute for Defence Studies and Analyses, New Delhi. Click here for detailed profile. Nitin Gadkari, the Minister for Shipping and Road Transport & Highways, visited Teheran on May 6, 2015 to sign a memorandum of understanding (MoU) worth USD 195 million for the development of Chabahar port situated in south-eastern Iran. India went ahead with signing the MoU despite the fact that Western sanctions against Iran have not been lifted as yet.11 Gadkari pointed out that “New Delhi is interested to contribute to Iran's ports, roads, railway projects” and hoped that Indo-Iran cooperation in Chabahar can help expand bilateral economic relations. India had been offered this project of developing the Chabahar port, which is located at the mouth of the Straits of Hormuz in the Persian Gulf way, back in 2003 by then Iranian President Khatami. It was intended to serve as a critical access-point to land-locked Afghanistan, and in the process bypass Pakistan which has been reluctant to provide overland transit to Indian goods passing through its territory. But the port development project could not subsequently take off in the face of American sanctions against Iran. In recent weeks, various countries have begun to show a renewed interest in Iran because of the hope that a conclusive dialogue between Iran and P5+1 on the nuclear issue would result in the lifting of Western sanctions on Iran later this year. And already a beeline of business houses have begun to court Tehran. With the Iranian government investing a lot in Chabahar to develop it as a transport and industrial hub, there is a great deal of enthusiasm to invest in the upcoming infrastructure around the port-city. The signing of the MoU between India and Iran, about a good six months after the declaration of Indian intent in October 2014, is expected to give a definitive push to the first phase of Indian investment to the tune of USD 85.21 million for equipping two berths in the port. Following the signing of the MoU, commercial contracts will soon be finalised to develop two berths as container and multipurpose terminals. In the second phase, India will reportedly invest USD 110 million to further upgrade and expand the port. As the press release from the Ministry of External Affairs suggests, Indian efforts are aimed at “significantly enhancing Afghanistan’s overall connectivity to regional and global markets, and providing a fillip to the ongoing reconstruction and humanitarian efforts in the country.” At the same time, an early materialisation of the route through Chabahar would also be a big leap forward for India’s connect-Central Asia policy. The Modi government has taken a welcome decision to renew India’s engagement in the development of Chabahar. But at the same time it needs to take better stock of the ground realities. The United States has already termed the Indian decision as ‘acting in haste’. A failure of the nuclear negotiations between Iran and the P5+1, and consequently the non-lifting of Western sanctions against Iran, would inhibit Indian investment in the project. Gadkari also met Iranian President Hassan Rouhani and discussed a number of issues of mutual interest. In order to expand the scope of bilateral engagement, Rouhani pointed out that the countries could “cooperate on number of issues including fight against terrorism and extremism” and hoped that “cooperation in the port of Chabahar … could open a new chapter in the two countries' relations.”22 He emphasised that Iran needed foreign investment for the development of the ‘South-North transit corridor’ and ports and welcomed Indian investment in “the development of Chabahar port and road and railway construction projects in southern Iran.” Rouhani was responding to similar sentiments that Prime Minister Narendra Modi had expressed in a personal letter. Gadkari also met the Supreme Leader's top advisor for international affairs Ali Akbar Velayati, who pointed out that, despite Western sanctions, bilateral trade had increased in the past two years and Indian exports to Iran have reached USD 4 billion. In October 2014, a senior Indian trade official had stressed the importance of Chabahar port for investment in various sectors, including the transit of India's products to other countries. A delegation comprising the representative of the Ministry of Chemical Substances, managing director of GACL, the then Indian ambassador to Iran, and two managers of Chabahar Free Zone visited the Makran petrochemical complex to explore the possibilities of Indian participation in the upcoming Makran petro-chemical complex in Chabahar. There is a sceptical view in the Iranian media that India revived its interest only in reaction to ‘big oil deals’ between China and Iran in the recent past. This view holds that India has decided to join the race rather than stay out. Iranians have nothing to lose in the bargain, and despite Iranian scepticism, there is hope that India would stay the course this time around. For Iran, India is a potential high value customer like China when it comes to the sale of oil and gas. Iran would be more than happy to cement ties with India given their historical links and prospects of Indian economic growth in future. While the sense of scepticism is a function of Indian hesitation in the past to oblige Iran for fear of provoking the US, the new found Indian enthusiasm to court Iran is replacing such cynicism with an overly optimistic account of bilateral engagement in future. Iran believes that the first MoU on Chabahar was signed during the previous NDA government headed by Atal Behari Vajpayee. Since the same party (BJP) is now in power in India, Iran’s expectations have increased. It hopes that the new government led by Modi would continue with the deal, retain its interest in the Chabahar project and use it effectively to access Afghanistan and Central Asia. Chabahar is located 72 kilometres west of Pakistan's Gwadar port. It holds immense strategic and economic significance for India. India has already spent about USD 100 million to construct a 218 km long (140-mile) road from Delaram in western Afghanistan to Zaranj in the Iran-Afghan border to link up with Chabahar port. The port was partially built by India in the 1990s to provide sea-land access to Afghanistan and Central Asia, bypassing Pakistan. India wanted to build the port as it would significantly reduce transport costs and freight time to Central Asia and the Persian Gulf. The port is also central to India's efforts to circumvent Pakistan and open up a route to landlocked Afghanistan with which it has developed close political and economic ties. Media reports reveal that during the first phase of the project, an Indian joint venture (JV) company — consisting of Jawaharlal Nehru Port Trust (JNPT) and Kandla Port Trust (KPT) — may partner with one or more Iranian concerns, with approval from the Iranian Ports and Maritime Organisation (P&MO), to execute the project on build-operate-transfer (BOT) basis. The JV will develop and operate the port for 10 years and transfer the port to P&MO thereafter. The JV will build and equip two berths within a year — one of them as a container terminal and the other as a multi-purpose cargo terminal. Based on the performance of the JV during the first phase, and depending on the satisfaction of both sides, further negotiations may be conducted for continuation of the arrangement again on a BOT basis. Apart from India and Iran, Afghanistan too has a high interest in Chabahar port and the transport corridor connecting it with the port. The Afghan leadership regards the Chabahar route as a more reliable alternative that would reduce dependence on Pakistan – the sole country providing Afghanistan with access to the sea. Recently, on April 27-29, 2015, Afghan President Mohammad Ashraf Ghani visited India and underscored the importance of the Chabahar port. Ghani and Modi pledged to work closely with Iran to make the Chabahar port a reality, and develop it as a viable gateway to Afghanistan and Central Asia. They agreed that routes additional to the existing ones will provide a major impetus to Afghanistan's economic reconstruction efforts.44 Even though India could not until now make much progress on the Chabahar front as part of its overall plan to bypass Pakistan and access Afghanistan and central Asia through Iran, it did build the Zaranj-Delaram highway in 2009 to connect with the 2,200 kilometre two-lane metalled road network, known as the garland road, circulating inside Afghanistan, connecting major cities in the country. India spent about INR 600 crore to build this connecting highway. The project was executed over four years (2005-2009) by the Border Roads Organisation (BRO). During this period, insurgent attacks claimed the lives of two BRO personnel, four Indo-Tibetan Border Police (ITBP) personnel and more than 100 Afghan workers. Due to India’s inability hitherto to go ahead with the Chabahar project, the potential of the Zaranj-Delaram highway has not been effectively leveraged. Cynics would say that the highway is now being effectively used by the Taliban instead. 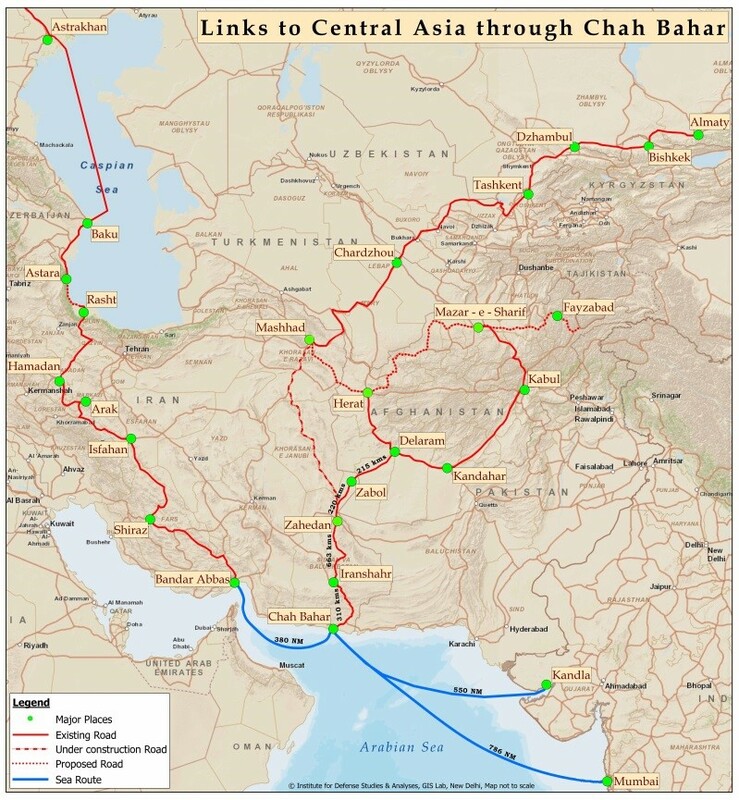 Iran has single-handedly developed the land route from Chabahar through Iranshahr to Zahedan and further north to Zabol and then to Milak close to Zaranj in Afghanistan. The possibility of laying down a railway line along this route to handle the traffic of heavy consignments had been deliberated upon in the past. The whole route is about 890 kilometre-long and, according to estimates by RITES, an Indian Government enterprise, the initial plan to build a railway from Chabahar to Zaranj would have cost about USD 1billion, which was unaffordable. By 2011, the Iranians shelved the plan for connecting Zaranj by rail and instead built a four-lane highway linking Chabahar with Milak. However, in view of the heavy traffic that would ensue from a full operationalisation of the Chabahar port, the road would require further upgradation. So far, Iran has invested heavily in Chabahar on its own. Its main aim has been to prepare Chabahar as the third major hub for its petrochemical industries (the first two are in Bandar Imam and Assaluyeh). The Iranian Government has earmarked a large area spread over about 1,100 hectares as a petrochemical complex. This area is being developed to attract both domestic and external investment. About 20 to 25 km away from the Chabahar airport, with investment by SATA (Armed Forces’ Social Welfare Investment Organisation), an Iranian company called Mokran Negin Development Co. has laid down roads, drawn up electricity lines and is in the process of building water connections. During the first phase, about 1,100 hectares of land has been developed, and about 3,000 hectares would be made ready by the end of the third phase. The Iranian Government also has plans to link Chabahar with Zahedan and Mashhad by rail in future if there is good returns on its investments. A new pipeline is also being considered for transferring South Pars ethane gas to Chabahar. A railway station is being built to connect the industrial zone with the port. According to Iranian estimates, there will be about 16 basic petrochemical complexes built in three different phases consisting of plants which will produce urea, ammonia, methanol, polypropylene, olefin and dimethoxyethane. The complex will also have an aromatic complex and a crystal melamine plant. Iranians are looking at a cumulative investment of about USD 80 billion by the end of the project. These Iranian efforts have not gone unrecognised. The petrochemical investment zone has drawn the attention of many foreign companies from China, Oman and some European countries. Some eight Iranian companies have already invested in the zone. China has shown active interest in the heavy oil refinery sector. A new Chinese refinery is coming up opposite the upcoming petrochemical zone. During a recent visit to Chabahar, one could see familiar Chinese squat barracks coming up on the refinery site. China has also started taking interest in the port itself. A Chinese dredger, probably leased to Iran and flying the Iranian flag, was seen anchored in the Saeed Beheshti terminal of Chabahar port. Chinese businessmen are making a beeline for investing in Iran in general and in the port city in particular. Some Chinese businessmen have already set up a special market complex to sell Chinese items. Gratified as the Iranians look upon being courted by Chinese investors, one could also mark a sense of unease about long-term association with China among Iranian interlocutors. In Tehran’s educational institutes, there was neither much interest in China nor enthusiasm about the prospects of Chinese investment, even though one could sense a quiet appreciation of “Chinese courage” in courting Iran despite American sanctions. There is a growing feeling among some Iranians that China’s approach is not only overly mercantilist – seeking to exploit Iran’s economic isolation – but also opportunistic. When the US and EU imposed new sanctions on Iran’s oil exports and on key financial institutions, including the Iranian Central Bank, China cut its imports of Iranian oil by almost 50 per cent. This means that China might seek more concessions to import Iranian oil, as it stays engaged with Iran in the coming days. The success or failure of nuclear negotiations between Iran and P5+1 would also impact on the full operationalisation of the Chabahar route. However, by expressing its desire to stay engaged with Iran in the Chabahar project, India is injecting fresh warmth into bilateral relations that have suffered due to economic sanctions by the UN, EU and US over the past decade. India, with its ever-increasing energy need, would benefit directly in case sanctions are lifted after the successful conclusion of Iran-P5+1 talks by June 30, 2015. The gradual lifting of sanctions against Iran could help Tehran recover about USD 100 billion in frozen oil profits, reopen its oil export market to the world and allow its banking system to do business abroad. According to rough estimates, if sanctions were to be lifted completely, Iran’s economy would grow by two per cent in the next year and the growth rate might jump to about seven per cent thereafter. Due to sanctions, Iran’s oil exports had fallen drastically by two-thirds between 2011 and 2013. As a result, its gross domestic product dropped sharply, inflation rate increased by 40 per cent, unemployment rose and foreign investment dried up. In all likelihood, sanctions will be lifted only in a phased manner according to the draft nuclear agreement and it will be linked to Iran’s fulfilment of its nuclear obligations. Sanctions could be re-imposed if Iran were to fail to fulfil its commitments. There is a lot of apprehension in Iran about the nature and scope of the phased withdrawal of sanctions being offered. Supreme Leader Ayatollah Seyyed Ali Khamenei has demanded the lifting of all sanctions immediately after the deal. However, the full potential of the lifting of sanctions on Iran may take a long time to be tapped and realised. Chabahar is an ideal port for both oil and non-oil trade. Moreover, there are various investment incentives now in Chabahar like availability of cheap energy and transportation infrastructure. India could consider investing in areas like automobiles, pharmaceuticals, textiles and food processing (tea, rice, spices, etc.). Local traders also talk about the craze for Indian imitation jewellery and the need for India to invest in education, particularly in IT and Business Management. Private educational institutes can be encouraged to open branches in Chabahar. Connectivity is a key issue for the Indian Government today. With Chabahar providing India access to Afghanistan and Central Asia, investment in that port project is likely to yield immediate strategic gains, while commercial considerations are most likely to follow provided we have the will to seize the opportunity. The Modi government ought to stay the course and go the whole hog to promote the country’s strategic and economic interests. India’s renewed interest in Chabahar is a welcome shift from its extremely cautious approach to the issue in the past. Its indecision has provided an opportunity for others to extend their sway over Iran and the region. Now that India has decided to re-enter the scene with a fresh determination to pursue its strategic interest, it should not be apologetic about the constraints that determined its past behaviour and look forward to regenerating warmth in its relationship with Iran. Given the unpredictability of Pakistani behaviour and the latter’s continued romance with radical elements opposed to US interests, the transit route through Pakistan to Afghanistan is likely to remain as vulnerable as it is today. Therefore, the strategic importance of the Chabahar route for ongoing international efforts to stabilise Afghanistan may not be unknown to the Americans and their allies. Through patient effort, India has to play a critical role in developing and thereby realising the full potential of Chabahar port which will significantly boost its image as a proactive regional power that is building such critical infrastructure not only to maximise its financial and strategic gains but also to propel regional growth and prosperity.